From author Lousia May ALcoot and adapted for the stage by Peter Clapham. 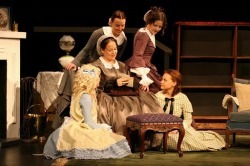 Little Women takes us back to the 1860's and the home of the March girls - Meg, Jo, Beth and Amy - in Boston, Massachusetts. We invite you to enjoy their everyday adventures in a not so everyday world. Greta goes to the end of the world to save her friend Kay from the Snow Queen. Come out and see Hans Christian Anderson's Beautiful story about the strength of friendship as it is brought to life by flatlands theatre company's theatre classes. Set in 1931, Pith! is an epic tale of travel and adventure told with the most economical means. An itinerant sailor leads a grieving society widow and her stoic housekeeper on an exhilarating and treacherous journey into the heart of the South American jungle... without ever leaving the living room. With only four dining room chairs and a phonograph, Jack Vail propels Virginia Tilford and Nancy Kimble from Providence, Rhode Island to New Orleans, Panama, and Ecuador, where hilarious encounters with a succession of explorers, shysters, gigolos, natives, and all manner of tropical wildlife have life-altering consequences for the ladies. It's an innovative, hilarious, and ultimately moving tribute to the power of imagination.